View of “Nick Oberthaler,” 2015–16. 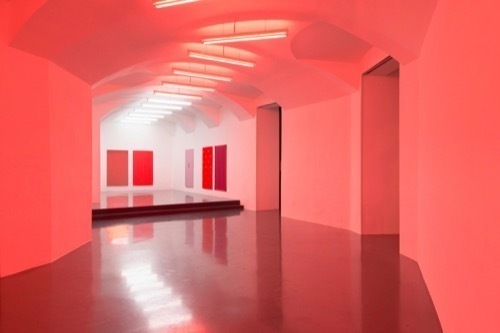 Soft, red light bathes Galerie Emanuel Layr’s anterior, and only farther in does the exhibition space return to a gallery’s traditional white-cube presentation—a mode so accepted that it almost never prompts comment. Nick Oberthaler installed the red neon bulbs in the entryway of the gallery not only to underscore the two-part architecture of the space but also to manipulate the colors of the images on view, all Untitled, 2015. With the exhibition title, “Distinct Features of Fast Oscillations in Phasic and Tonic Rapid Eye Movement,” the artist is referring to the field of neurology, in which researchers have investigated variations in visual perception under different sensory circumstances. Red is not always red; turquoise is not always turquoise. This is true not only in the controlled conditions of scientific research, but also as perceived by gallery visitors, as the works near the entrance register very differently to the eye than those farther back, even though they all consist of the same hues—thanks to the diffuse light illuminating the acrylic paint on aluminum. One work stands out: In the white-lit part of the exhibition, a mirror-like, polished stainless-steel plate reflects not only the space itself and visitors within, but also, when viewed from a certain angle, the other artworks, and the reddish light in the entryway. It is the first time, via this disruptive moment of self-reflection, that the thoroughly installation-like character of Nick Oberthaler’s exhibition truly reveals itself.